Asian Koel (Eudynamys scolopaceus), these large birds have been residing on large trees in our neighbourhood for many many years, maybe a couple of decades! 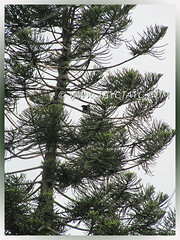 Mostly seen perched on a very tall and aged Norfolk Pine tree, growing in someone’s compound, six doors away from our home. We’re absolutely thrilled to know its identity finally. A big thank you to Chan Kwee Peng, an active member of ‘My Nice Garden Chat’ on Facebook, who helped ID’ed it. Asian Koel …what a lovely name, and the second word ‘Koel’ matches beautifully with its loud echoing territorial call ‘ko-eeul’! Probably that’s how its common name came about. 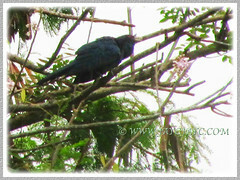 Check out the male and female Asian Koel’s call/sound at YouTube, can be quite compelling…!! 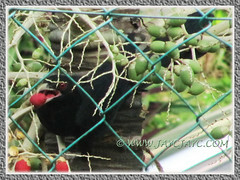 And, more exciting was being able to see a couple of them feasting on the ripen fruits of our Manila/Christmas Palm tree at the sidewalk outside our home. A wonderful feeling upon seeing these fabulous feathered creatures up-close recently. This was our first time and a couple more opportunities followed subsequently. Pity though that they were too swift in their flight and mission, and I wasn’t able to capture more photos to share here. Also glad that we’ve finally nailed the culprits that have been polishing off those vibrant red fruits, besides the squirrels. Usually, we only get to view silhouettes of them atop high trees and that too, it’s difficult to see as they are hidden by the dense foliage. Frankly they’re much more heard of than seen. The male bird’s call resonates loudly, especially in the mornings, early afternoons and evenings… love that sound, don’t think I’ll ever tire of hearing it! Description: The Asian Koel, being a member of the cuckoo order of birds, is a large, long-tailed cuckoo, measuring between 39-46 cm in length and weighs 190-327 gms. An adult male has glossy bluish-black or greenish-black plumage and relatively short wings. Eyes are red, bill is thick, large, slightly down-curved and coloured light greenish-grey. Legs and feet are grey. The female on the other hand is very attractive, with brownish crown and rufous streaks on the head, dark brown upper parts that are speckled with white and buff spots, the under parts are cream to whitish and heavily striped with dark brown bars. The dark brown tail is also barred in greyish-white. Stout bill is pale greenish and eyes are red. The familiar call between the male and female differs greatly. They are very vocal. Male calls loudly with a continuous repetitive ‘Koo-ooo’ (or ‘Ku-hu’) in rapid series, increasing in pitch, while the female makes a rhythmic, short, shrill ‘Kik-kik-kik’ whistles in response. Distribution: Tropical southern Asia, from south China, India and Sri Lanka, to Southeast Asia (including Malaysia and Singapore) and the Greater Sundas, New Guinea and Solomon Islands, plus Australia. Habitat: Lives mainly in dense thickets of tall trees, secondary forest, as well as low-density urban areas including parks, gardens, towns and villages. Also found in coastal mangroves. Breeding: The Asian Koel is a brood parasite, that is, the female lays its eggs, usually a single egg, in the nest of other birds, chosen by the male who often choose the crow’s nest. Its egg is pale greyish-green or stony coloured, and speckled with reddish-brown, like that of the crow’s. Read further from the Wikipedia link given below. I’m so delighted to be able to capture an image of this elusive large bird, the Asian Koel. 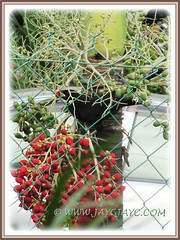 Beautiful bird and love seeds Christmas palm. Good photography. Thank you lots for your generous comments, Yara. Have a wonderful weekend and happy gardening, yah! i enjoy reading your interesting and informative post. I have similiar birds (a big group) roosting on palm trees in my garden. I’ve identified them as Asian Glossy Starling (Aplonis panayensis). The bird in your photo has a shorter tail compared to the Asian Koel, so it looks more like the birds making their homes in my garden. I have taken many shots of them polishing off my palm fruits and would be doing a post on them later. Hi Elsie… thanks for visiting and sharing your observations. 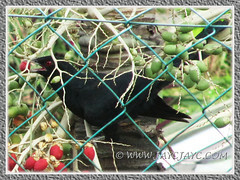 I wish to confirm that this bird as photographed is indeed the male Asian Koel, a large and long-tailed bird (pls. click on the top-most image to see the enlarged version). We have also seen up-close its partner, the brown-spotted female bird. Moreover the typical loud call of these birds sealed its correct identity. Anyway, thank you for introducing the Asian Glossy Starling to me… I’ve googled and learned the differences between them. Hi Jacqueline, I’m glad to hear that you are spot on on its ID. There is also a count sheet (with 28 common Malaysian birds featured ) by http://www.mygardenbirdwatch.com/. I used this to verify the birds found in my garden. Happy bird-watching! Thanks for your quick response, Elsie! Appreciate the useful link you’ve provided – I’m sure it’ll come in handy when I need it.